It's less than 24 hours before my first away game of the season and excitement is starting to build nicely. I am bringing my 6 year old to what will be his first away game and he is also suitably excited about the prospect. It's games like this that are the reason we follow a football team. Without getting too misty eyed, going to watch your team away from home is the true essence of being a fan. Feeling part of the super white army, singing songs and the all round vibe of being in the away end is an experience that is hard to beat. And winning is the best feeling in the world. My son will have to deal with a bit more bad language and silliness (don't tell the wife) but it's part of every supporters rite of passage to witness things like this away from Prenton Park. Eddie Bishop being sent off at Bury, Ian Muir's last minute winner at Wigan and a Rovers fan in a monkey suit at Burnden Park are memories I will cherish for ever. But if excitement is high on the Wirral, it must be off the scale in North Wales. The chance of their biggest attendance since colour telly was invented has created a cup final atmosphere amongst our opponents. Anyone and everyone has been exhorted to get down to the Racecourse for tomorrow's game along with a huge expectation of victory. Are they in good form? Sort of but not as good us. How good are they? Well it's basically the same team that smashed and grabbed a one deflected shot win earlier in the season, with the added benefit of a big home crowd to roar them on. We can beat them if we turn up because we are better than them and score more goals than them. They still play a limited style of football but hopefully home advantage will encourage them to attack us, which totally plays into our hands. So I will be going to sleep dreaming of a last minute thunderbolt sparking scenes in the away end. I will settle for another own goal and hanging on for dear life. Ubi fides ibi lux et robur. Edited 2 time(s). Last edit at 02/02/2018 22:43 by mini_andy. It won't be a 1-5 job but a win all the same. Ps My 6 yr old grandson is going too but with his Dad in the home end. Good memories and bad memories from away days at Wrexham. I remember us being tonked 6-1 in a top of Div 3 clash in 1978, full house, massive Tranmere following. And of course, Ian Hulme running their defence ragged when we hammered them 5-1 in 2004. If I was offered a point for tomorrow's match right now, I'd take it to keep momentum. Massive game for both clubs. A game like this can make or break your season. The pressure is on us especially as we fluffed our lines at Flyde in our last high profile away encounter. Wrexham have a good defensive record so it will probably be low scoring. If we score first we will win. I can't predict this one, it all depends if the team turns up, play well and we'll win (says captain obvious). I'm feeling jittery about this one. My away record is poor this season; haven't seen us win. From a frustrating visit to Plainmoor on day one, a bore draw at Guiseley, the late equaliser at Macclesfield, the hammering at Fylde.....surely it's time for a change of luck. I'm going for a 1-0 defeat; setting the bar low so that anything else is a bonus! Or, perhaps I should stay at home so as not to jinx the boys! Whatever happens it should be a great atmosphere. If I'm feeling a little nervous excitement now, I'll be neurotic tomorrow. Note to self: everything will be okay. C'mon the rovers!! Really can't see Macc slipping up at home to Torquay and sure don't want an 8 pt gap again.. CMON THE ROVERS! A massive game for both teams. A draw wouldn’t be too bad, but ideally we need to win. Our recent form against top teams, and on big occasions has me nervous about this one. What I want the score to be, and what I think it’ll be are 2 different things. I want a win, but I think we’ll lose. For me Wrexham are more likely to top the division than Macclesfield and with their game advantage afford to let them make ground on us advantage we cannot . In the final analysis it was out two games against the eventual champions that separated us for automatic promotion. More a case of nether wanting to lose. 0-0 or very close 1-0 either way. Wrecscum don't concede many at home. Hoping they come out of their tortoise-shell and attempt to play a little today as they have much faith in their ST. If that's the case then 2-1 for us but can see only see there being a goal in it (for us of course). Just hoping for an exciting game!, whatever the result it’s far from over. Looking forward to a grand day out with a few beers and a good SWA song! This is definitely a win able game but, we need Eddie and Cooky both playing. Eddie IMO is equally as good as Rides in defence and far more effective going forward and will put the Wrexham defence under pressure. As with other posters cannot see many goals, going for 1-0 Rovers. Barrow v Sutton Utd is postponed. If we win today and Aldershot draw or lose at Leyton Orient then we will go 2nd in the table. I think if we get at them from the off , unsettle them and show them they're in a game there will only be one outcome . Use our pace and hope Clarke ( or Rides ) and Buxton can put some quality balls over then I'm confident we'll take the three points . Attack is the best form of defence - let's go for it . I'm feeling a sneaky 1-0 as well courtesy of a Jennings 40 yard daisy cutter. Think it will be a niggly game. Just hope the ref is up to it but not holding my breath. We need to be disciplined and keep 11 on the pitch! Strange Ridelagh starting in front of Clarke as they are hardly likely to be all out attack. Any win would be good but going for a draw. This should so have been a BT game. I'm stuck watching Wigan Vs West Ham with Tranmere on the radio. I agree hardly, this should be on BT. ive just watched leicester demolish Posh. got wirral radio on now. wigan v west ham both max power n aaron creswell playing and see that cole stockton has gone straight into the carlisle side. Not good... Wirral Radio saying the defence playing like at Fylde!! Taylor at fault for first apparently also. Edited 1 time(s). Last edit at 27/01/2018 15:45 by hong kong rover. Macc have just gone 1 up.. cmon rovers! 2-2 can't complain coz Macc only drew. Shots won though. Daggers season seems to be falling apart. Edited 1 time(s). Last edit at 27/01/2018 16:57 by hong kong rover. Not a bad result and sounded on balance we were the better side... but the sort of game we needed to win to claw back points. Interested to hear MM's reasons in press conference as to why he started with Ridelagh rather than Clarke. Personally think Clarke should start if fit. Edited 1 time(s). Last edit at 27/01/2018 17:07 by ADD. Listen to the radio had a dodgey period immediately after we scored the first? just listened to mickys post match interview, he didn't seem too happy with some of the refs decisions. reckoned that Rovers edged it and said their keeper was busier than ours. I listened to wirral radio and they said that norwood wasn't at his best and was suffering a bit with the flu. We were the better side. But happy with a draw. You mean the goalie that conceded two open play goals rather than the one who concede one in open play and had to face a penalty? I think 8530 that Loyden was suggesting their keeper made some very good saves whereas Taylor was according to Wirral Radio at fault for their first and dropped a routine header in the second half. Wold have taken that result before the game and got 16-1 on the 2-2 draw so no complaints! Taylor's handling was dreadful-we were lucky not to concede more than two due to his errors. Fair result but we were the better team.I have reservations about Taylor.Ginnelly wasn't much of a threat and I was surprised it took so long for Clarke to come on. Now let's go and batter Ebbsfleet! 2nd half may as well not even happened? We were clearly the better footballing side for 90% of the game. We looked the only side likely to win it. I personally thought Wrexham would put us under more pressure and their style of play was unattractive for most of the game. Another decision goes against us for their penalty; their players and the crowd didn't ask for anything (significant if you ask me) just a massive celebration when they were given it. I'll take the draw with a tinge of disappointment as the game was there for the taking. If I'm allowed to say it, Taylor didn't fill me with confidence today; he does have one of the best defenses in the league in front of him for those who want to quote statistics. 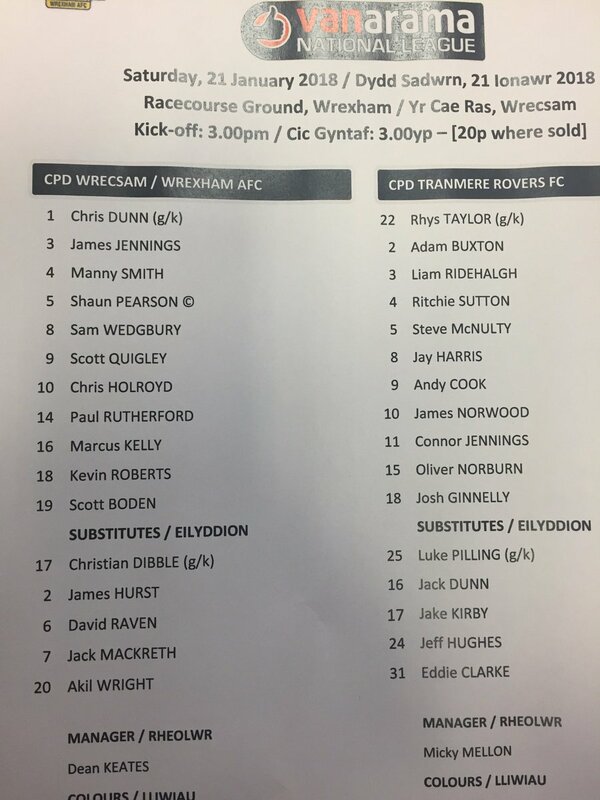 Just a word about the organisation, Wrexham FC, policing and crowd "control" today; shambolic. Police blaming licensees, licensees blaming the police for no entry to pubs, then told some licensees would let people in. Queuing outside the locked turnstiles well after the official opening times. Apparently not enough seats as fans were standing on the steps for the game; it was in fact our stewards controlling this which meant no choice but to stand for most of the game (not a problem for me, but difficult for my 75 year old father-in-law). Coming out of the ground we were shepherded away from the main road towards the on-coming Wrexham fans as the coach had been told to park in the university car park; quite tense when the two sets of fans met gridlocked in the passageway with a number of aggressive comments flying around. To top it all, a member of North Wales police was authoritatively directing fans in one direction for the train station whilst a little further along another officer was directing them back the other way; you couldn't make it up. We haven't lost ground with regards to pole position which is a real positive and overall a very good performance from the lads today. The only times I was able to sit down were before the game and at half time.I couldn't believe it when we were forced away from the main road and towards the Wrexham fans after the game whether we were on a coach or not[I wasn't]. And trying to get through past the station towards the centre of town was a shambles. licensees, licensees blaming the police for no entry to pubs, then told some licensees would let people in. Queuing outside the locked turnstiles well after the official opening times. Apparently not enough seats as fans were standing on the steps for the game; it was in fact our stewards controlling this which meant no choice but to stand for most of the game (not a problem for me, but difficult for my 75 year old father-in-law). Coming out of the ground we were shepherded away from the main road towards the on-coming Wrexham fans as the coach had been told to park in the university car park; quite tense when the two sets of fans met gridlocked in the passageway with a number of aggressive comments flying around. To top it all, a member of North Wales police was authoritatively directing fans in one direction for the train station whilst a little further along another officer was directing them back the other way; you couldn't make it up. +2 really weird place to go, over hyped police and security and not a hint of trouble. We ran the game from start to finish. But game was craaap. No bar staff for 1800 fans. We should ban all beers for them in future as I felt like a Martian. I thought Raven was very good today. We could and should have won that game. If we play like that for the rest of the season we will do ok.
My seat was in among the Wrexham massive to the left of the Rovers' fans which was fun and how I managed to keep calm when Cookie scored the equaliser I don't know! We were by far the better side and the Wrexham fans I spoke to, who didn't know I was in there under-cover agreed. Big loss for them when James Jennings went off and Scott Quiggley is quality at this level if still not match fit. Onwards and upwards Rovers.. we can do this! Defended Taylor when he signed, but after today, who bad must pilling be. Taylor was shocking, he only had a couple of things to do and did them badly. Nor missed a golden 1 on 1 again and a class save from there keeper from cookie in the first half the difference. Don't think they will be in the mix come the end of the season, bu will we, only time will tell. Before the game most would have taken the point but, we had a couple of good chances to win it. Home form should take care of itself but, we need to be consistently winning away from home. Edited 1 time(s). Last edit at 27/01/2018 21:54 by Jack of all Trades. A point away at this stage of the season is a good valuable point if Rovers can keep getting 3 pts at home then that puts the pressure on the teams around you. I think you have all of that pretty spot on, Phil. The only thing I would add is to agree with Mickey's post match comments that we probably could have used the ball a bit better in the second half. Reassuringly though, Tollitt and Wallace to come back in will give confidence that we can have that bit of quality to unlock a defence in tight games like yesterday. Even if Wallace will have to come off the bench to do it! It will be good to have both back but it will be sometime before either is really a arp and with both,especially Wallace there must be uncertainty as whether fitness will be retained. Still think what happens with Wallace and Tollit may make the difference between promotion or not. Clarke was brought on (maybe a little late) when the Wrexham defence were tiring. Wallace would have played the passes needed to maximise Clarke's pace and the spaces opening up. Of course, signing Wallace was a risk but he's our best player in terms of vision and the skill needed to open up defences. I'm never one to judge a ref's decision given how hard the job can be and i'll keep it brief but how on earth was that a penalty? Seen it so many times now and the gesture that the ref gives to Sutton as his explanation is that he elbows Pearson. When, where, how and what?!? I understand if he's said that he grabbed him and forced him to the ground but it's just such an odd call that i had to get it off my chest. Would've taken the point though even if i thought we could beat them and tbf feel that we should've, still happy though not to lose any ground with a good run-in to come up. You read my mind, was just telling my mate that I couldn't believe how quiet everyone had been on here about it. Absolutely shocking decision. A great occasion with the SWA in fine voice in front of a full house. no addition to the scoring. match there would be a pen awarded at every corner kick!!! The whole of the crowd and all of the players had no idea why the pen was given. Having looked at the video several times, which the referee doesn't have the luxury of, it appears that Sutton's right arm was over Pearson's left shoulder when they challenged for the ball. The referee must question how this came about and it is evident that it is two players legitimately jostling for space and position. It appears that Sutton did not pull, push, deliberately hinder or grab Pearson.. it's just how they both arrived for the aerial challenge. Sutton won the joust and headed clear. It could be argued that Pearson put himself in that position and then fell over. Nobody in the ground thought that it was malpractice apart from the referee. I am loathe to criticize refs because it is an impossible job and I have done it at Junior level with great reports until I jacked it in because I couldn't be arsed with the unjustified flack. However, I think 99% of referees would'nt have given that penalty. Spot on I think he gave it for that reason. It was a clear foul on the keeper from Cook before the corner that we scored from. The ref at Anfield watched VAR and still gave a ridiculous penalty so we can’t complain to much. We are non league the refs are essentially tier 5 refs, they are relatively in experienced and not professional, we didn’t win because we didn’t take chances not because the ref gave a penalty. In fairness to the ref Sutton has his arm round their lads shoulders, that could go either way any week, if we give the ref a decision to make at times it will go against us. Cook fouled their goalie in the run up to the corner so it’s all equal anyway. Edited 1 time(s). Last edit at 30/01/2018 06:48 by Higgosboots. You fail to add that there was a blatant push on Cook in the penalty area early in the game; all I'd like to see is consistency. At what level in life does accountability stop. As Bill Shankly used to say, It was a penalty because the ref gave it, they all equal out over the season. It also doesn’t help when the manager makes ridiculous statements such as “Cook went for a diving header and fell off the pitch resulting in a booking”. Well that’s the funniset falling off a pitch I’ve ever seen. If he refers to slowly walked towards and climbed over the hoardings in celebration. What is that refs attitude going to be towards us next time he officiates us after hearing comments like that when it’s clear as day a yellow card. You inadvertently hit on a good point about impartiality, or lack of. Criticism indeed. I doubt whether many at this level have the capacity or cognitive ability to retain such information. Dealing with (or attempting to) the here and now is as good as it gets. Wrexham draw 0-0 at Gateshead and see that Ollie Banks scored for Swindon tonight.